It has long been known that the pathogens causing sleeping sickness evade the immune system by exchanging their surface proteins. But now scientists at the German Cancer Research Center have found an additional parasite strategy to escape the immune system: They confuse the defense system with sugar. The sugar chains on the coat protein prevent the binding of protective antibodies and thus increase the pathogenic properties of the unicellular pathogens. African trypanosomes, the pathogens causing sleeping sickness, are notorious for their ability to escape the body’s immune defense. The trick that prevents them from being completely destroyed by the immune cells has been known for decades. The unicellular parasites are covered by a dense layer of identical proteins, the so-called variable surface glycoproteins (VSGs). Antibodies of the infected human are directed against these proteins and the parasites are largely eliminated as a result. However, occasionally individual pathogens change their surface protein completely. To do this, they simply switch to another VSG gene – they have around a thousand different ones available. “It’s like putting on a new coat,” says Nina Papavasiliou, immunologist at the German Cancer Research Center (DKFZ). The trypanosomes masked in this way are no longer recognized by the antibodies, they multiply rapidly, and the infection, which the immune system had initially kept in check, flares up again violently. Stebbins and his team have now examined various VSGs using X-ray structure analysis. In one of the molecules, VSG3, the researchers discovered binding sites for sugar molecules on the “outside” facing the immune system. Michael Ferguson from the University of Dundee, Scotland, found out with further analyses that these binding sites are actually occupied with a multitude of different sugars. In order to find out whether the sugar chains have an influence on the proliferation of parasites or on the success of the immune defense, the scientists around Papavasiliou created trypanosomes whose VSG3 lacked the sugar binding site. 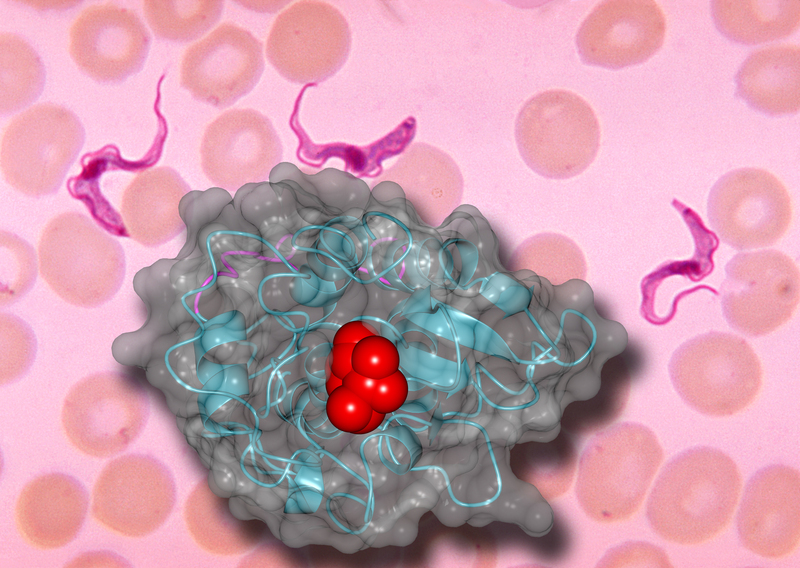 While mice infected with normal trypanosomes quickly died of the infection, the animals survived an infection with “sugar-free” trypanosomes and were able to completely eliminate the pathogen from their blood after a few days. Vaccinated with sugar-free, inactivated trypanosomes, mice developed a protective immune response. However, the transmission of pathogens with normal VSGs did not trigger any vaccination protection. The researchers found the binding sites for the sugar not only at the VSG3, but also in numerous other VSGs. “The sugar chains coupled to the VSG do not completely paralyze the immune system. But they are clearly obstructing it. In addition to switching to new VSGs, the different sugar chains are an additional strategy with which the parasites make it difficult for the immune system to eliminate the pathogens,” explains Papavasiliou. Trypanosoma brucei, the pathogen causing African sleeping sickness, occurs mainly in West and Central Africa. The pathogen transmitted by the tsetse fly attacks the central nervous system and causes severe neurological disorders. Without treatment, infection can lead to death. The number of reported cases last declined, falling by 90 percent between 1999 and 2015, from 28,000 to 2,800 patients (source: Medecins sans Frontieres).